Life has seriously been crazy lately! I've had some late midterms, had to play catch-up with writing my thesis (due in two weeks, ah! ), and a few other things on my plate that have left me with barely any time for myself. Now that a few of those obligations are ending, I can take some 'me' time, even if it's still limited. In those rare moments where I find myself able to pamper myself, I try to accomplish multiple things at once. For example I'll put on a hair mask and type up an essay or I'll take some time to go swimming but that will also be my break from studying. As a senior I have tons of things going on, especially in this month before graduation, so my time is precious! 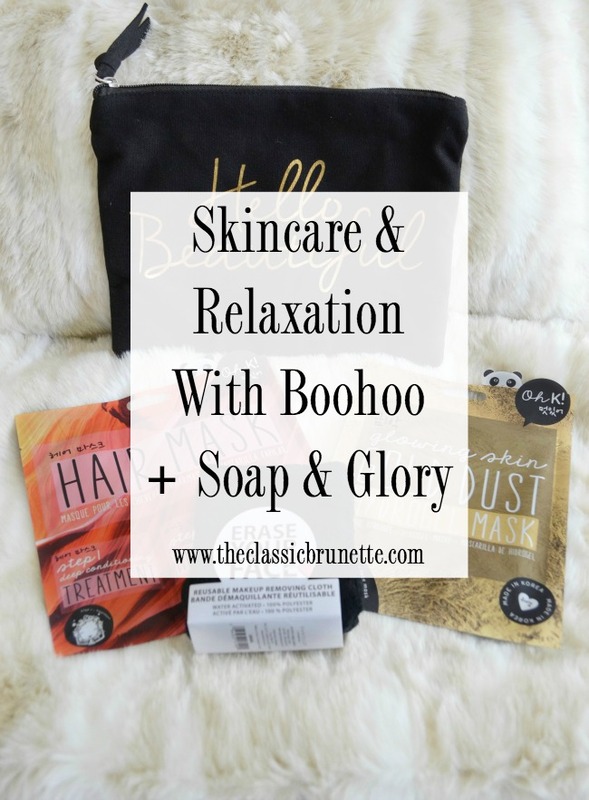 Thankfully Boohoo and Soap & Glory have been helping me find products that are great for my short moments of relaxation! I think my favorite way to feel relaxed and pampered when I'm short on time is to moisturize and smell delicious. Both are accomplished with Soap & Glory's For Daily Youth Moisture Lotion and their Hand Food! I can't get enough of the moisture lotion since it smells like peaches and makes my face SO soft! And I always seem to have the driest hands on the planet, so the hand food is great to keep in my bag. Plus it doesn't hurt that it smells like marshmallows! Soap & Glory has actually been one of my favorite beauty brands since I discovered it in middle school, and it's been great for those 'treat your self' moments or spa-quality product use at home! Boohoo was also nice enough to gift me this red scalloped bikini just in time for the warm weather, and I can't wait to start heading to the pool during my study breaks! We have one in our community that is less than a block away from my house, so it's so easy to pop on over for a quick swim, something I'm so thankful for! I sometimes have a difficult time committing to one swimsuit, which makes Boohoo one of my favorite places to buy swimwear! The prices are affordable, the pieces are trendy, and they have so many options! I'm so excited to wear that bikini for summer and adopt these new beauty products from Soap & Glory into my routine! Thank you to Boohoo + Soap & Glory for gifting me these products! Thank you for supporting the brands that make The Classic Brunette possible! I love the bikini, I've never tried those products before, they sound like they may be worth trying. Such a cute bikini, love the scalloped details! What a cute bikini! I have never heard of this company before but it sounds delightful! I love the scallop details on that bikini! I actually have a pretty similar one that I wore over spring break and got a pretty horrible scallop tan line! Haha learn from my mistake and use lots of sunscreen!! Such a cute bikini. Love all the products here. Thanks for sharing! These products sound so good! Glad you can carve out some time for yourself, that's a necessity! I need that bikini!!! SO cute! I love this bikini! That red is SO bold and fun! It does sound so hectic for you, fingers crossed life gets less busy soon. 2. I always hear so many great things about Soap and Glory products, I need to try them out! Pampering yourself is so important! I love a good face and hair mask! Oooh I want that gold dust mask! Love Soap & Glory products! Also that bikini is way to cute! Soap and glory is such a cute brand with great products! Loving that cute bag too! I haven't heard of this brand before, but it sounds amazing! I love that scalloped swimsuit! I want to try some of these and pamper myself right now! Love the bikini! 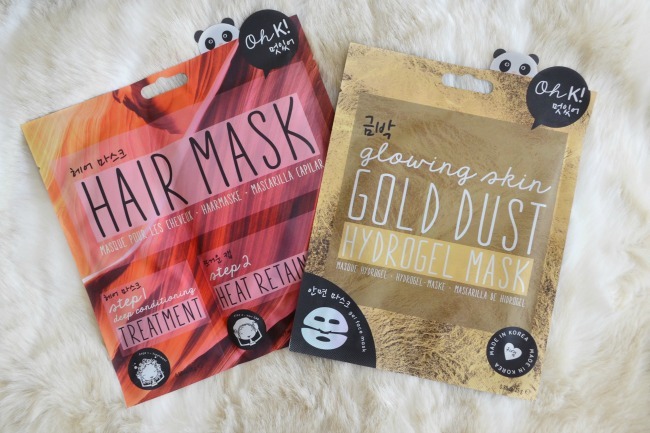 I loved using one of Soap and Glory's face masks - I just can't remember the name....but I need to check these products out! That bikini is too cute! Love the color! That scalloped bikini is everything! I just love Soap & Glory products. I keep a travel sized Hand Food in my purse at all times! That is the cutest swimsuit! I love the color! Never heard of any of these skincare brands, but that red bikini!! So cute!! I've heard great things about their products but I need to try them still! Soap & Glory is THE best!! !